The Newton range of 1+1 pocket value note counters and fitness sorter has taken the South African and sub-Saharan markets by storm. In a little over 12 months Page Automation has installed in excess of 1000 units in South Africa, Namibia and Zimbabwe. Further units have also been installed in Nigeria. The machines which are ideal for retail banking, cash center, and foreign exchange and casino environments is the smallest in its category and allow for full fitness and counterfeit detection, have a counting speed of up to 1000 notes per minute and can take up to 7 currencies. In addition, serial number tracking is available on the US$ and Euro. The machine comes standard with a USB and LAN Port for remote management and central monitoring. Jan Maritz, Senior account manager at Page Automation JHB branch sealed a deal with Obaro (Pty) Ltd providing them with 26 Denominator machines across 23 of their branches. Obaro is an agricultural company within the MGK group, supplying the farmers in the area with feed, fuel and implement. The business began in Rustenburg and now has branches across Mpumalanga, Gauteng, North West, Limpopo and Northern Cape Province and is a prominent player in irrigation farming just north of the Orange River. Jan came across the opportunity one day soon after joining Page Automation. He would occasionally fill up with diesel at Obaro’s branch in Rustenburg, and he noticed that there were often long queues and it appeared as though they were not managing their cashing up system very efficiently. On enquiry, he learned that the staff endured the very tedious process of putting the cash they received in boxes under the counter, manually counting and cashing up and then placing all the money into a wall safe. The local Absa ATM at Skiunsdrift and Dwaalboom was used to deposit the cash into the bank at the end of the day. When Jan and Sales Director, Pieter De Beer met with Obaro’s management team to carry out a demonstration, they were blown away with the advanced technology of the Denominator and could instantly see the benefits it would have to their business; the time taken to cash up would be considerably reduced by counting 1000 notes per minute. It would be a lot safer and more secure since the money would no longer be kept in the staff’s possession or under the counter, cash up could take place immediately with a receipt print out from the machine. The chance of human error would also be eliminated and proper counterfeit detection could take place simultaneously during the deposit. Obaro were eager to roll out the machines to start seeing the benefits and cost savings across their business and proceeded with roll out plans almost immediately. They are the first farming cooperation in the country to have these machines and have been extremely accommodating to the extent of providing Page Automation with a forklift and a person to assist with installation at every site. All the Obaro installations that have been rolled out to date have gone very smoothly with the support of the back office team and dedicated technicians that have ensured quick and seamless installations. Jan carried out extensive training for all the staff at each site to ensure they are all productive from the start and are equipped with a user guide to refer to when in doubt. With only a few more sites left to carry out installations, Jan attests to the success of the project, “The whole process from site preparation, installation, testing and finally training has been carried out very efficiently at all the sites with virtually no glitches and as a result Obaro has awarded Page Automation with all future sites across the group including Senves, NWK, Afgri and Agri”. The Page Automation Academy has been operating for just over 3 months and we are proud to report that it has been successful in its efforts to assist a few of our staff and their families with financial support. In some cases, these are staff that are single parents or sole bread winners for their families and the Academy attempts to ease that burden. Over the recent months, the Academy has signed up 3 candidates and is funding their children’s education for the year. The academy not only provides funding for education, but is also able to assist with other support such as medical, training programmes, sponsorships and various other causes. Most companies invest in charities as part of their corporate social investment, but we believe that supporting our people first is more important. In these tough times where the cost of living is increasing and the recession has taken its toll on many, it’s the smaller things that often make the difference and that is why at Page Automation we are pleased to offer this opportunity. The committee members comprising of Adrian De Oliveira, Stella Kumalo and Solly Lidavha are dedicated to the cause. “Our aim is to be fair in our allocation of the funding by carefully evaluating each application, but it’s a great pleasure to help our fellow staff where we can!” says Director, Stella Kumalo. KYOCERA Document Solutions recently announced that Business Equipment Research & Test Laboratories, Inc. (BERTL), a leading independent testing laboratory for imaging devices and workflow solutions, honoured KYOCERA’s colour and monochrome TASKalfa multifunctional product (MFP) series with its Spring 2012 ‘Best Office Line of the Year’ award. The KYOCERA TASKalfa devices honoured by the BERTL Best Office Line of the Year award include: the TASKalfa 7550ci, TASKalfa 6550ci, TASKalfa 5550ci, TASKalfa 4550ci, TASKalfa 3550ci, and TASKalfa 3050ci colour MFPs; as well as the TASKalfa 8000i, TASKalfa 6500i, TASKalfa 5500i, TASKalfa 4500i, TASKalfa 3500i monochrome MFPs. BERTL analysts evaluated several hundred MFPs in 2011 and identified key features that made KYOCERA’s TASKalfa series stand out from the competition, honouring the series with the BERTL Best Office Line of the Year award. BERTL analysts found that from device setup, to printing, copying and scanning, all TASKalfa devices outperformed every other office product lines tested during the year. “KYOCERA constantly raises industry standards with all of its ultra-reliable products, and being recognised by BERTL’s for the Office Line of the Year award for its industry-leading TASKalfa line of MFPs is a result of our continuing commitment to excellence,” states Michael Powell, Product Marketing Manager, KYOCERA Document Solutions South Africa Pty Ltd.
BERTL examines network management utilities, concurrency and contention, print and copy productivity, image quality, return on investment, competitive advantages, accessibility, design and build quality, standard functions, modularity of design and upgrade path, installation, and several other categories to determine which products stand out from the competition. 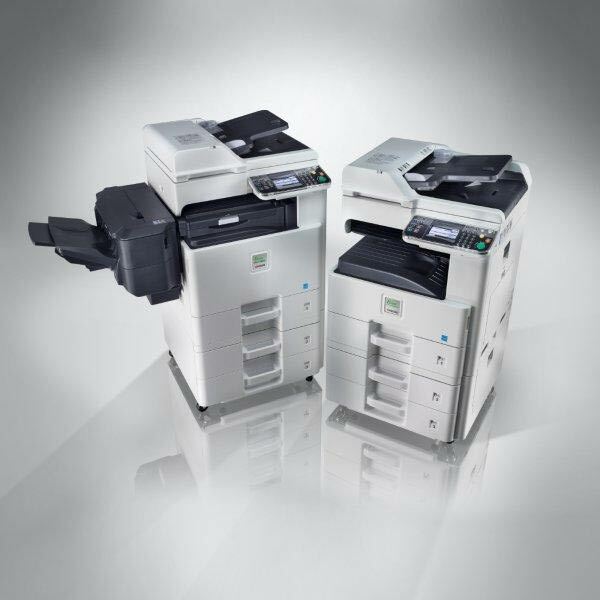 KYOCERA Document Solutions South Africa has unveiled two new ECOSYS monochrome A3 MFPs – the FS-6525MFP and the FS-6530MFP. The reliable MFPs are easy to install and maintain, making them ideal for areas where service staff are not immediately available, such as remote or highly secured locations. The FS-6525MFP and the FS-6530MFP offer great functionality for offices producing low print volumes and their small physical footprint is perfect where space is limited. Advanced workflows that need more steps to be carried out are easy to customise and install with the newly integrated HyPAS* technology. Both MFPs benefit from this powerful and scalable solution platform that delivers easily customisable workflows. Apart from individual developments customers can use well known applications such as language select, fax connect and Mail2Me which suit innovative customer processes. The easy to operate devices have wizard navigation to aid set-up and offer great usability for typical activities, such as ‘scan to email’, which significantly reduces user error and time spent carrying out jobs at the device. The FS-6525MFP and the FS-6530MFP are extremely energy conscious with an 18% lower TEC (Typical Energy Consumption) value than their predecessors. As with all of KYOCERA’s ECOSYS products, they benefit from long-life drums and toner-only sustainable technology which ensure high reliability, longer maintenance cycles, low running costs and minimal waste. KYOCERA has continuously developed its ECOSYS sustainable print technology which celebrates its 20th anniversary this year. SMARTslip is an exciting, innovative and cost effective service provided to employers and offers Cost effective Instant and Secure, delivery of payslips.